FREE FROM GLUTEN, GRAINS, DAIRY & REFINED SUGAR. SPECIFIC CARBOHYDRATE DIET (SCD) & PALEO. The new gummy bear moulds I ordered arrived a few days ago so we just had to try out some super-healthy gummy bears. Having Crohn’s disease, I can always do with some gut-healing power and it’s a huge bonus that my daughter loves eating them too. There are absolutely no nasty ingredients in these: just wholesome goodness. You can enjoy them as a snack and improve your digestive health at the same time. Making these was such a fun thing to do on a really rainy day. Only problem is, they don’t last very long around here! I use only Great Lakes Beef Gelatin for these as it comes from grass-fed cows and is one of the best quality gelatins available. The grape juice you use is very important here especially if you are following the Specific Carbohydrate Diet (SCD) as most commerical juices have a lot of sugar added. 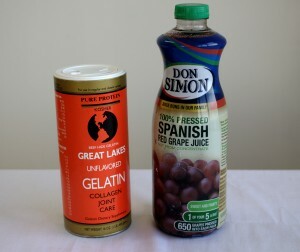 Don Simon grape juice is 100% grape juice, similar to Welch’s 100% grape juice which only seems to be available in the U.S. If you are unsure about any brand of juice, I would highly recommend contacting the manufacturer to ask them if sugar has been added to the product. Place all the ingredients except the gelatin in a saucepan on a low heat. Add the gelatin slowly, whisking all the while until mixed well. Remove from the heat before the mixture boils. I usually pour it into a pyrex (or any large jug) at this stage and allow to cool for ten minutes because I find the gummy bears pop out of the moulds better. 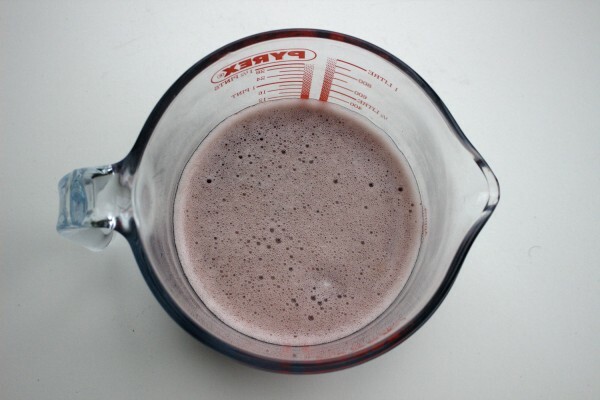 When filling the moulds however, use the smallest jug you have because pouring the mixture in can be quite tricky! 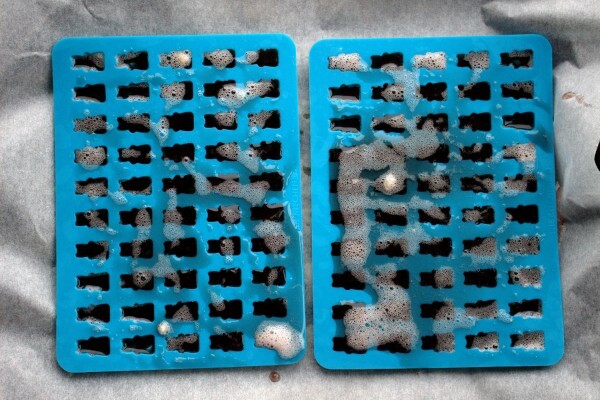 Place the gummy bear moulds on a baking tray lined with parchment paper to contain any spillages. 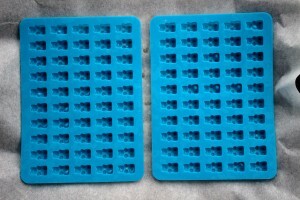 It's better to slightly over-fill rather than under-fill the moulds. Then place in the freezer for 15 minutes. 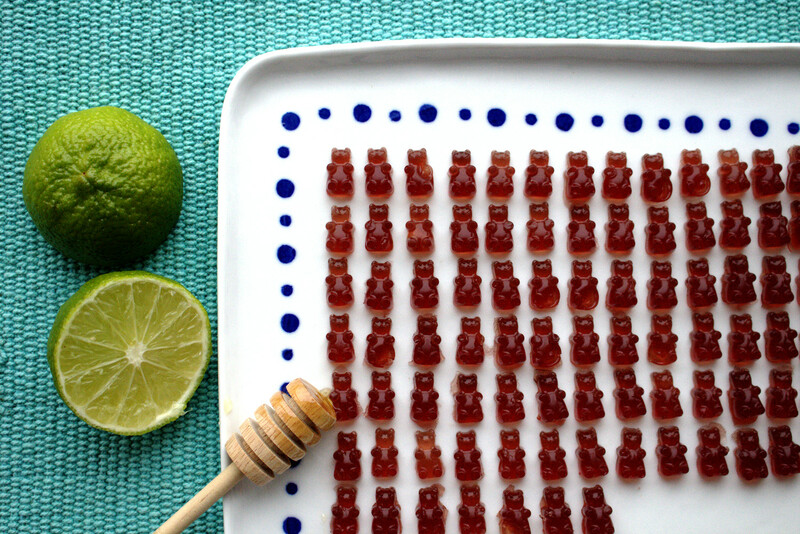 The gummy bears can be stored in the fridge in an airtight container for two weeks, if they last that long! This recipe makes 100 gummy bears using my moulds. If you have some extra left over, you can just refrigerate it and eat it like regular jelly. The recipe is also easily halved or doubled. That’s great Sian. I didn’t have one and I spilled quite a bit! Hey luv really enjoying your food. i found you on the scd nz and oz fb page. I have since lose my pass word to fb and cant get back in. anyway my question is where do you get your gelatin? Yes Tania. I buy it from Amazon. Seems pricey but lasts quite a while. Best of luck! Hi Karen, I imagine any juice would work. Just make sure the juice is SCD-legal. It should be 100%, not from concentrate and ideally you should email the company to confirm there is nothing added.